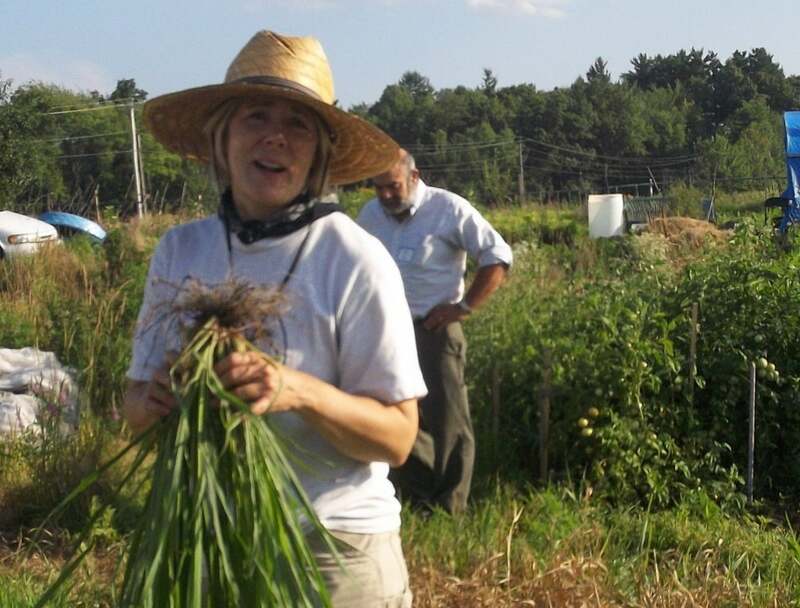 JoAnn Robichaud first heard about New Entry Sustainable Farming Project (New Entry) from a farming organization in Western MA, and later, she read about New Entry in an article written by a Boston Globe journalist (who later became a New Entry farmer). JoAnn’s interest was piqued. Yet, it took a while for JoAnn to make that phone call which would dramatically shift the direction of her work life. She was active in community gardening, and was a regular farmer’s market customer, but she hesitated to jump in since she had no prior experience with farming. It took years for JoAnn to get to a point where she was willing to commit. Eventually, she attended the annual New Entry Open Farms Tour, where she met and spoke with program farmers on New Entry’s incubator farm sites. She took New Entry’s Explore Farming course, where she assessed her readiness for a farming career, and learned about the realities of farming. When she finally decided it was time, JoAnn registered for New Entry’s Farm Business Planning Course, where she learned how to create a comprehensive, detailed business plan which aligned with her farm business goals. JoAnn graduated from the Farm Business Planning Course in the spring of 2011, thus taking the first step toward launching her farming career. During the summer of 2011, JoAnn initiated her practical farming activity at one of New Entry’s incubator farm sites, located in Dracut, MA. During that first year, JoAnn and her partner Kamal absorbed all they could from New Entry’s Technical Assistance Coordinator, more experienced incubator farmers producing on adjacent plots, books, and their successes and mistakes, to establish the farm they call “Bobbin Farm.” JoAnn says that her biggest challenge when starting out was learning to prioritize since there were so many unknowns. During her time at her incubator farm plot, JoAnn also learned technical farming skills through New Entry’s Hands-on Field Training Series. JoAnn has attended workshops in High Tunnel production, Soil Health and Organic Fertilizers, Raised Beds and Field Preparation, Irrigation and Water, Small Farm Equipment and Tools, Organic Pest Management, Weed Management, Disease Management, and Cover Cropping. JoAnn has also attended New Entry’s livestock trainings and a Spin Farming training workshop. JoAnn is currently in her third year farming with New Entry. Her farm plot has grown from ¼ acre in the first year, to ½ acre in the second year, to 1 acre in the third year. Joann hired a helper for the first time this season to whom she will pass along lessons learned. She has gradually shifted from the role of a learner, to the role of mentor to new incubator farm site producers (but admits she still has lot’s to learn!). JoAnn says “I learned a lot from other farmers during my first few years, and I’m sharing lessons learned now with the new farmers.” The farmers at her site are learning about cooperative farming. Together, they arranged to share expenses for irrigation and to share efforts to grow seeds. JoAnn and Kamal grow an impressive assortment of produce, in order to spread their risk and provide diversity to their markets. They grow: sweet potato greens, slicing cucumbers, carrots, sweet potatoes, potato fingerlings, eggplant, tomatoes, ground cherries, winter squash, pumpkins, collard greens, broccoli, chard, escarole, lettuce, kale, dandelion greens, radishes cabbage, onion, shallots, peas, spinach, leeks. Arugula, Brussel sprouts, three varieties of eggplant, four varieties of sweet pepper, and melon for various markets in the region. They operate their own small CSA, where they sell directly to customers in Lowell. Approximately 50% of the revenues for Bobbin farm come from sales to the World PEAS Food Hub, where Bobbin farm produce is consolidated with produce from over 25 other New Entry farmers, and distributed to over 410 families around Boston and the Lowell area. The World PEAS Food Hub also sells into institutional markets such as Senior Community Centers in Waltham, Somerville and Dorchester; Bridgewell’s Pathfinder Program; the Merrimack Valley Food Bank; Tufts University Dining Services; the Journeyman restaurant in Somerville, and other institutional markets. Bobbin farm’s mission is to provide high quality, organically grown produce at reasonable prices. As such, Joann strives to maintain harvesting methods that adhere to best practices for food safety and quality. As part of her marketing agreement for selling to the World PEAS Food Hub, JoAnn submitted a food safety plan for her farm business. In this plan, she details standard operating procedures in regards to water use and quality, farm worker health, hygiene, and sanitary practice, as well as harvesting, field packing, and transportation. Water at Joann’s farm site is tested for microbial content to determine if further action is necessary. This water is used both for drip irrigation and for washing. JoAnn’s standard practice is to clean harvest tools and bins with a 10% bleach solution to ensure produce to be delivered either to the Food Hub or to her other markets is in a clean container. JoAnn also provides training on these practices, along with basic health & hygiene practices (hand washing, how to properly cover any cuts, etc), to her farm worker, Natasha, who helps in the field and with planting, harvesting, and delivering produce. No raw manure is used on JoAnn’s fields and she only purchases aged compost. Joann (and the other incubator farmers at her farm site) benefit from recent improvements made to the shade shelter washing station area, which was extended at the beginning of the season to allow for perishable greens to be protected from direct sunlight for improved post-harvest conditions. In 2013, several new program farmers had land on plots adjacent to JoAnn’s farm site, many of whom were not familiar with how to properly use the large wash stations that are installed. JoAnn provided mentorship to two new farmers in how to properly run the wash station, to ensure that water used to wash initial dirt off produce is not combined with the fresh water for the final wash prior to packing. By sharing her knowledge on food safety and post-harvest handling practices, JoAnn is able to help her community of beginning farmers and contribute to the overall safe practices among our incubator farmers. In 2014, Joann will graduate from the incubator farm site and move on to an independent plot of her own, taking lessons learned and best practices with along with her. She worked with New Entry staff to identify available farm land suitable for her needs. As Joann takes on a new independent farmer status, she can continue to depend on New Entry staff to provide support and guidance when she feels the need for assistance.